With Fate/Extella games, the cross section between the hack and slash genre and Fate intersect. After playing the first Fate/Extella game, there was a great degree of uncertainty as to the quality of its upcoming sequel. The previous game had a borderline bloated storyline that felt overcomplicated and incredibly drawn out in a way only series writer, Kinoko Nasu, could provide. Not only did the game lean heavily on the fan service, the gameplay also felt incredibly clunky and the tug of war mechanics quickly got on my nerves. Now that the sequel Fate/Extella Link is out, hopefully those issues have been ironed out. The story of Fate/Extella Link is a sort of mixed bag. Whereas the game’s predecessor felt excessively intricate, Fate/Extella Link dials the complexity far too low. Following the story of the previous title, the sequel starts off with a new threat arising along with newcomer servant, Charlemagne, joining the crew. The general concept of idealism conflicting with reality is clearly present, hitting similar beats to ones from Fate Stay/Night. However, the story is a bit of a disappointment, considering how heavily toned down in nuance and personality it is compared to the past title. Generally speaking, the narrative this time around is very straightforward with most events being of little consequence. Along with the simpler story, the established cast from the first game just seems to be along for the ride. They retain their colorful quirks, but they don’t contribute much to the actual plot progression. With the exception of Charlemagne, the servants on the team don’t really play an active role in the plot. The first game felt a lot more character-driven with the three main servants taking the lead on the plot, resulting in a more unpredictable storyline. 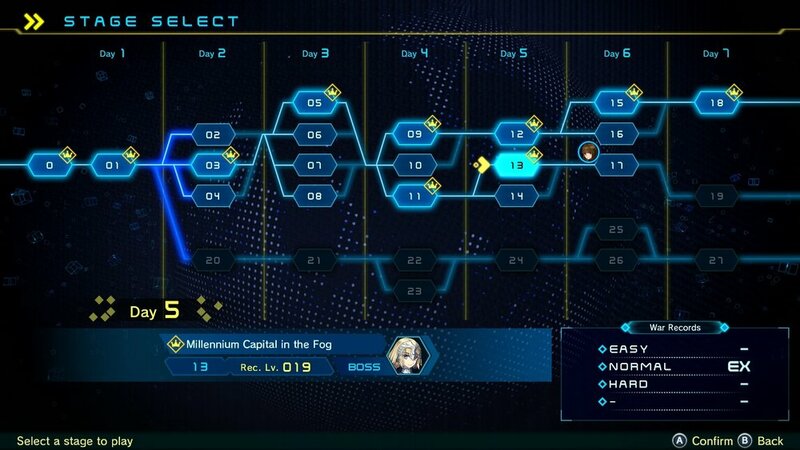 As the game allows the player to select levels from a timeline select screen, there’s easy access to the branching storylines. However, they felt far too similar to truly justify the repetition. Regardless, it gave me Drakengard 3 vibes with multiple endings and story branch setup. However, Drakengard 3’s story had so much more to offer and concluded in a distinct and beautiful manner whereas Fate/Extella Link’s felt underwhelming, though admittedly serviceable. Mechanically, Fate/Extella Link simplifies the general sector power struggle from the first game by making friendly NPCs actually competent. Rather than having to solely rely on your character to defend sectors, supporting NPC servants hold their own. This reduces the tug of war over sectors, thus resulting in a more typical hack and slash experience. 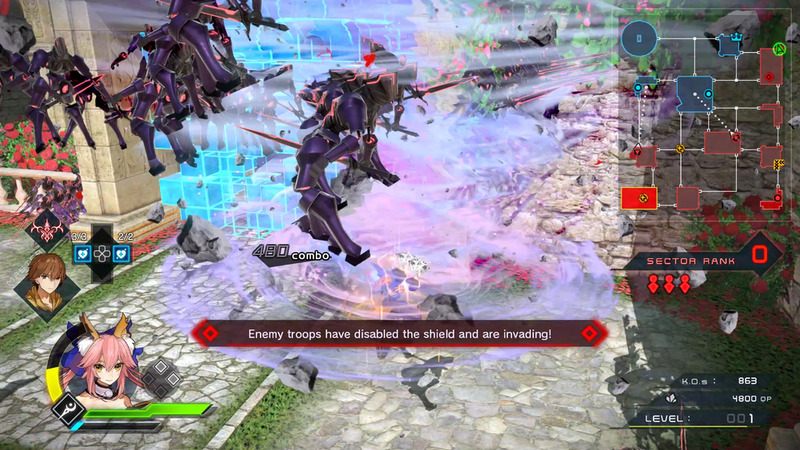 Basic enemies are often just there to take damage, while the stronger enemies do deal damage from time to time. Playing on the normal difficulty definitely lacked any real degree of challenge. The combat has been overhauled from the previous title. 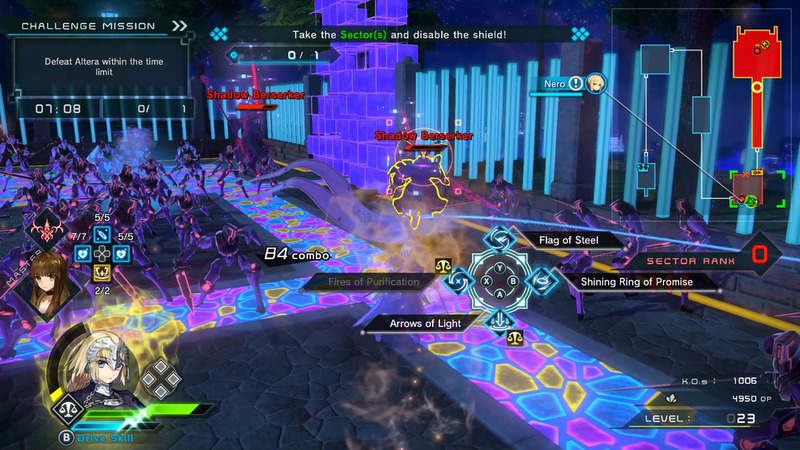 Where the original felt closer to a conventional Dynasty Warriors title, Fate/Extella Link adds its own, arguably contrived spin to various forms of attacks. Combat now features a Moon Drive gauge that fills up as the player defeats enemies. Once the gauge is full, the player can activate their Moon Drive state, allowing them to build up their Noble Phantasm gauge as well as unleash their Drive Skill before the gauge runs out. After the Noble Phantasm gauge is full, the player can activate their servant’s Noble Phantasm in which the servant reveals their True Name in a lengthy cinematic cutscene that deals heavy area of effect damage to all nearby enemies. Admittedly, the Moon Drive mechanic doesn’t really flow well with me as I usually cleared out most enemies before finishing off with my Drive Skill. Besides the Moon Drive, the combat features an Active Skill system that really changed up the gameplay. These skills use cooldown timers and come in various forms. They overshadow the basic combo-based combat in favor of quick and effective bursts of damage along with Super Armor during execution. Though there are a lot of different types of skills, I found very little use for any of them besides the ones that dealt damage. Though the idea of a skill system seemed neat, in practice it added little more than a less satisfying replacement for the core light to heavy attack combo system already in place. Regardless, there is an undeniable satisfaction in seeing huge groups of enemies getting knocked around by your servant. Even though the novelty quickly wore off, the roster is pretty big this time. Unfortunately, the characters play very similarly and oftentimes, I would just spam active offensive skills regardless of who I played as. Admittedly, it was enjoyable to play as various characters from the Fate universe, as shallow of a complement as that may be. Presentation-wise, Fate/Extella Link feels a bit shabby. Though the 2D art looks great for the most part, the 3D models lack definition similar to the previous title. Many of the character designs stand out and really add to the experience despite the occasional questionable design choice. The levels vary heavily in terms of visuals, but nothing really stuck out environmentally due to the fact that most areas are still segmented off rather than being truly connected. The soundtrack for Fate/Extella Link felt incredibly generic and uninteresting despite being composed by MONACA, the studio that brought us the gorgeous soundtracks of NieR and NieR: Automata. Despite the general low budget feel and repetitive gameplay, I enjoyed my time with Fate/Extella Link. The game provides a solid, streamlined experience worth playing for fans of the series, but beyond that, it’s hard to recommend. Though the game provides a slew of playable characters, there was little substantial variation between them. The shallow gameplay and subpar story leave much to be desired, but in the end, the game is still an enjoyable and satisfying hack and slash experience. Scarlet Curiosity is the video game equivalent of comfort food. It is an experience with little substance, but I still wholeheartedly enjoyed it. CrossCode is the very definition of a passion project as it was painstakingly developed over a span of seven years, and it really shows. The game is filled to the brim with content, including a lengthy story campaign, diverse enemy designs, and many side quests. It really has a lot of bang for your buck. Party Hard 2 is a serviceable, yet mostly bland game with little going for it besides some of its music and the tense gameplay. Killer7 is a work of art that surprised many in the past. Now that it’s been remastered for the PC, a lot of new players and old fans alike can finally experience the game in gorgeous high definition. Personally, the game has always been a landmark title to me that set a creative standard that has yet to be topped.